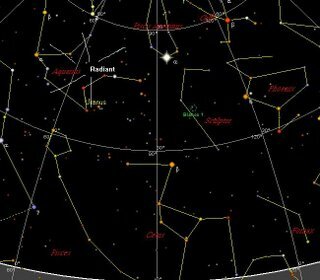 The Southern Delta Aquarids meteor shower peaks tonight. This is a relatively good shower, reasobably visible from Southern climes. IF IT WERN'T FOR THE $$%%#### CLOUD. Ahem. Anyway, the best time to see the shower is actualy 2-3 am Saturday morning, when the radiant is at its higest, then you could expect to see a meteor every 3 minutes or so. The map on the left shows the radiant at midnight as seen from the Southern Hemipshere. Phil Plait's comment on the inncorect tide answers in the blogthings quiz brought to mind a radio interview I heard while ferrying the kids to an evil fast food establishment. The local ABC radio was interviewing the long-long-long range forcaster Ken Ring*, who claims to be able to predict the weather up to a year in advance. I was listening with half an ear to some highly confident forcasts when he claimed that a certain date would be windy beacuse the Moon was at perigee, when it was closest to the Earth. Now, when the Moon is at perigee there will certainly be a bit more tidal force than at apogee (those of you with a handy access to calculators may work this out for yourself), but will this cause more wind? I can't see how (Bad Astronomer to the White Courtsey phone please). He also claimed that the Full Moon cleared cloud, and that after 10 pm on the night of a full Moon the sky will be prisitine and clear. Now, he may have meant to say that there is a statistical association between full Moons and clear skies, but I've watched enough cloudy skies on nights of the full Moon to seriously doubt this. Unfortunately, there is no good public cloud cover database for Australia, and none that covers night time, but by comparing the 3 pm before the full moon rose vs the 9 am after the full Moon sets as a proxy for cloud cover after 10:00 pm, it looks like full Moon nights are just as likley to be cloudier, or no different, than they are to be clearer (comparing 6 months of data from weather stations in Adelaide and Melbourne, eg see here) . Also, on nights of the full Moon where cloud did clear in Adelaide, it didn't clear in Melbourne. So from this limited proxy data set it looks like the full Moon does not clear cloud. Does anyone have access to a decent night time cloud cover data set that can be correlated with Moon Phase? Mr Ring has some rather dubious claims for a lunar-weather connection on his web site, with the usual claims that the Establishment is supressing alternative views, plus some rather strange ideas on global warming (apparently it can't happen becuase carbon dioxide is heavier than bulk air. Yes, really), but as a confirmed experimentalist I have a hankering to test the "Moon-clearing cloud" hypothesis. * He claimed that most of Melbourne's July rain might be in the 5 days leading up to July 23rd, for example, but that was in fact the time of lowest rainfall in Melbourne. Also compare his Sydney predictions with the actual Sydney data. It looks like my laptop can be ressurected. I have to wait a week for a replacement part, but that's better than not having a laptop at all. 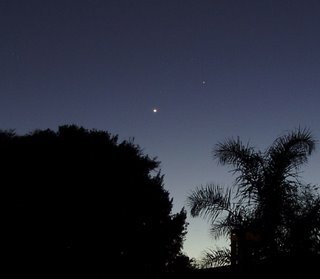 The western horizon as seen at 6:00 pm in Adelaide, similar views will be seen elsewhere in the Southern hemisphere. 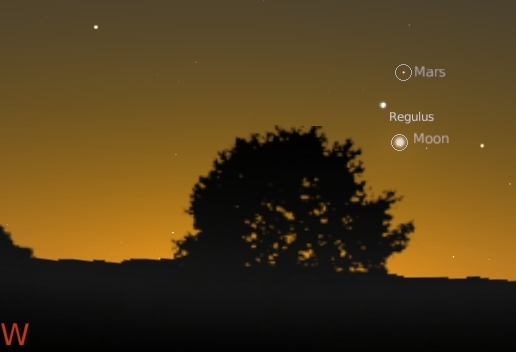 On this Thursday night (27 July), Mars, the Crescent Moon and Regulus will form a nice triangle, have a look. Due to work, cloud etc. I missed out on the conjunction of the Great Red Spot and Red Spot junior, nor did I get a chance to report on it. So belatedly, I will point you to Tom's report, the Bad Astronomers report, and the press release from the Gemini Observatory (from whence the image comes). Also, drop in to the Red Spot jr website, with lots of amateur images of the two meeting. My University has been getting a bit of good news lately. A recent paper, “Ranking and Clustering Australian University Research Performance, 1998-2002” lists the University of Adelaide in the top two national research rankings based on academic staff numbers (ie output per staff memeber), below the University of Melbourne and above the University of Western Australia (where my mate Phil works). In terms of total research output, the University ranked seventh, and was the highest ranked South Australian university on both measures. 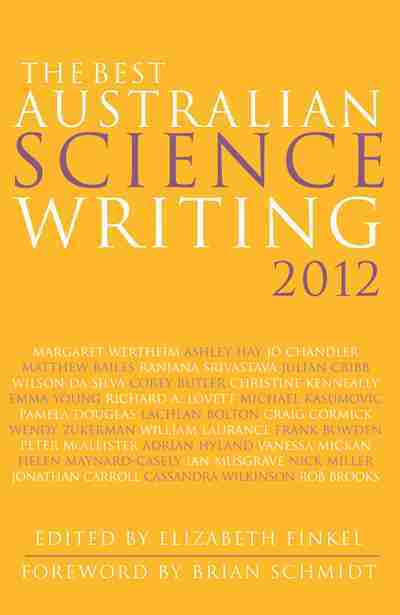 Also, Cosmos magazine has published a list of Australia's top 10 young minds. One of the top 10 was Tanya Monro, Professor of Photonics at the University of Adelaide. Also, I'm part of a team that got $25,000 to study factors that control nerve development. Wheee! As I am desperatley trying to avoid doing Real Work (tm) , I've updated the site slightly. If you look to the right and down a bit, I've added boyruageek to my blog roll, and added a podcast section. 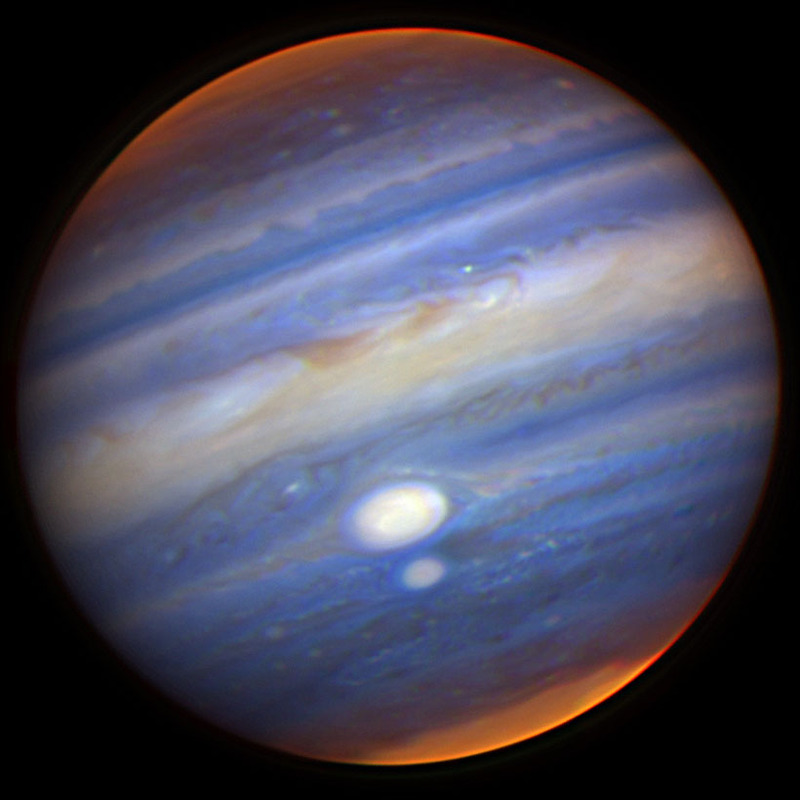 Jodcast is always good value, don't forget to check out their astronomy podcasting links page. If you are popping over to the ABC Science Show page, check out the podcast on the film Flock of Dodo's and Aussie comedian Flacco's take on Intelligent Design. The New York Academy of Science's Science in the City is a gem, Oliver Sachs on the wonders of spectroscopy, and a fantastic (but 22Mb long) panel discussion on the origin of life by some of the top experts in the field. Waaayyyy back when, before Cassinin arrived at Saturn and Huygens landed on Titan, astronomers wondered about the high level of methane in Titans atmosphere. Methane doesn't last very long, in geological terms, before it is broken down by UV (incidentally creating lots of interestion organic compounds that might contribute to the origin of life). So where was the methane coming from? One idea was that Titan was covered in seas of Methane. 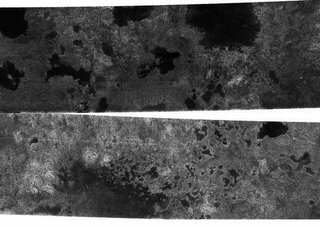 Then Cassini arrived, and while tantalising dark patches were found, no methane seas were evident. Huygens laned in a spot where it looks like methane rivers occasionally ran, and there was lots of evidence for fluid erosion, but no evidence of standing bodies of methane. Some of the dark patches and connecting channels are completely black, that is, they reflect back essentially no radar signal, and hence must be extremely smooth. In some cases rims can be seen around the dark patches, suggesting deposits that might form as liquid evaporates. This is seriously cool (pun intended). Maybe future missions will investigarte these patches in greater detail. See also The Bad Astronomers take. Yes, I'm back again. I should manage a few more regular posts after a very hectic fortnight. One drawback is that my trusty laptop died (in the middle of writing an important report). It might be resurectable, but I won't be doing any webcam imaging for a while [sigh]. SO it looks like my Venus animation will end here, I'll work on putting the animation together in its "high quality" form now. The Australian ABC's online science section, The Lab, was 9 years old last Friday (Happy Belated Birthday). Nine years is a long time in the ephemeral world of the internet. Go check it out (they have a very nice collection of podcasts too). My first foray into the world of online astronomy was writing the monthly Southern Skywatch for In Space. But with work and so on I will probably be posting very irregularly over the next two weeks. Sorry. Family matters means that I will be away from the computer for a while. See you in a weeks time. Venus and Alderbaran shine together in the moring twilight. If you click on the picture, you can see in the larger version the Pleiades and Hyades, faint though they are in the morning light. Remember the Solstice just a while back? Well, the Journal Nature has put out a special article on Science on the day of the solstice, (its free for a change). There's everything from students measuring the Earths diameter, to a Hubble deep field, and more. Check it out. 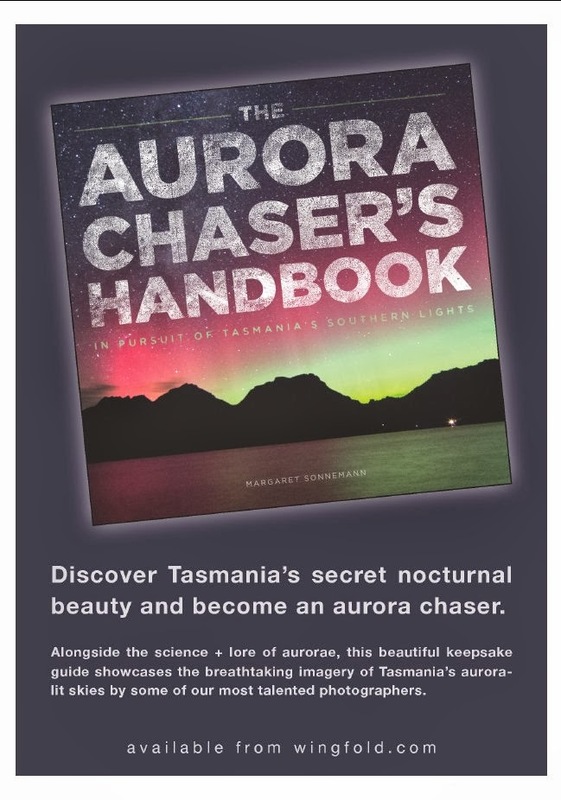 The July Edition of Southern Skywatch is now up. Venus near Alderbaran, More planetary lineups, and a unaided eye occultation of xi Tauri by an asteroid.